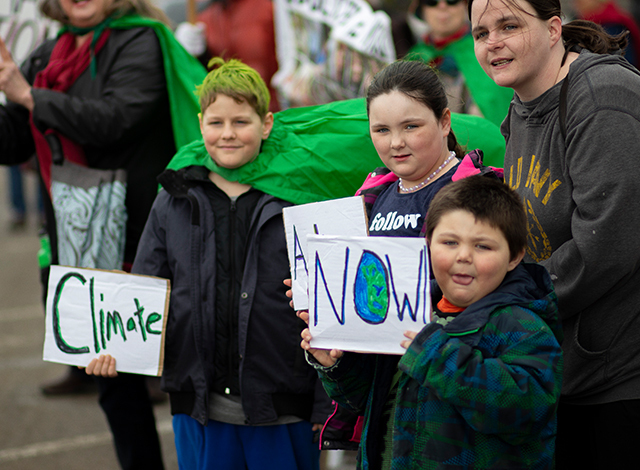 Protesters hold signs declaring, “we need climate action now” and “there is no planet B” in front of Smiths Falls town hall on Friday, March 15. Photo credit: Emilie Must. Inspired by 16-year-old Swedish activist Greta Thunberg, community members in Smiths Falls came together to protest climate change as part of a global effort on Friday, March 15. Cities around the world held protests today. The protest in Smiths Falls is one small part of a larger effort to urge world leaders to take action and reduce carbon emissions. The protest was held at noon in front of the town hall in Smiths Falls and organized by Green Party candidate Anita Payne and local environmental activist Susan Brandum as part of the Citizens Climate Lobby. Supporters wore green capes and held signs saying, “climate chaos is here” and “honk for climate action” as cars drove down Beckwith Street. Mayor Shawn Pankow and town councillors Wendy Alford and Peter McKenna joined the protestors. 11-year-old Gabriel St. Louis, left, protests alongside his family members in front of Smiths Falls town hall on Friday, March 15. Photo credit: Emilie Must. “The future is worth looking stupid for,” Andrew MacDonald said while wearing a joker hat. Payne says she hopes this protest will be the start of monthly protests for many months to come. The hope is that neighbouring towns, such as Almonte and Carleton Place will join the movement. 11-year-old Gabriel St. Louis came out to protest with his hair dyed green for the occasion. “Climate change is destroying the earth,” St. Louis said. The Citizens Climate Lobby is planning to make a third request to council to join the Federation of Canadian Municipalities Climate Action network. There were three previous climate change protests in Perth since January, but this is the first time a protest was held in Smiths Falls. There was also a protest later in the afternoon in Perth.